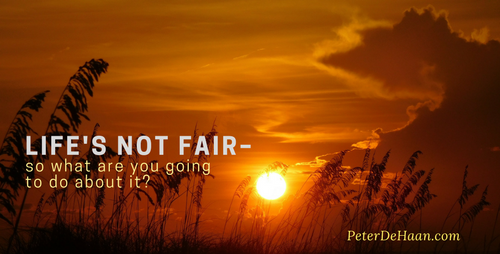 How often have you heard someone exclaim, “It’s not fair!”? It’s true; life’s not fair—and I, for one, am glad. If life were fair, then we would all go to hell. As less than perfect beings, we all do wrong things upon occasion, some more frequently than others. As a result, we deserve punishment from a holy and just God; we all deserve to go to hell. Justice demands punishment. Fortunately, life is not fair. The God of the Bible offers mercy to those who follow him. Though fairness demands hell, an eternal death, those who follow Jesus receive something else: heaven, an eternal life. Thank you God for not being fair, for offering us mercy and grace instead.